Analyze how the foreign policy of Woodrow Wilson differed from that of his predecessors. Woodrow Wilson’s presidency was known for the way he handled US foreign policy. Wilson had not intended to focus on foreign policy, though, as fulfilling a domestic reform was on the top of his list. He even states that it would be “the irony of fate if my administration had to deal chiefly with foreign affairs." This irony, though, became a reality. Previous presidents had all been isolationist, and had never joined in wars between other countries. Unlike them, Wilson was the first President to make an alliance with foreign countries and join them in a war they were fighting. Wilson did not like the heavy-handed foreign policy of his predecessors. He said, "The force of America is the force of moral principle." The central idea behind his policy of "moral diplomacy" was to influence and control foreign nations and events through the exercise of economic power. In Europe, however, World War I had begun, and Wilson favored neutrality. He was also very religious which could have impacted his decisions, as he once stated that his decisions were God’s callings to him. This was very different from his isolationists predecessors, like Taft and Roosevelt, who focused mainly on the United States. Taft created the Dollar Diplomacy, which called for the U.S. government to promote stability, primarily in Latin America and the Caribbean, in order to yield investment opportunities for American companies, with the hope that the development would also result in prosperity for the affected nations, which Wilson repudiated in 1913. He wanted U.S. foreign policy to advance democratic ideals and institutions in Mexico. On one hand, he wanted Mexico to be successful in its efforts to become self-governing, but on the other hand, not trusting Mexico to find its way through its own revolution, he felt compelled to show them the way. This displays his desire to spread democracy throughout the world, which was different from what Roosevelt and Taft had in mind. Wilson had always been one who believed in peace. He was always neutral and did not want to go into war. He also wanted to do what was best for the country, which is a quality that a president must have to succeed. At the beginning of WWI, Wilson had declared neutrality for the United States and urged the public to remain neutral as well. Neutrality proved to be very difficult as the US got involved in some problems with the Germans at sea. Wilson then took action to declare war, and this was when his involvement in foreign policy increased. Once the war was won, he hoped to achieve this aim through a just and fair peace treaty and the formation of the League of Nations, which were rejected by the American public. Wilson’s impact on the United States’ foreign policy is very significant. He was one of the most involved in international affairs and is also well known for winning the First World War. His spread of democracy, especially in Mexico, really established his views on foreign policy and how it should run in the United States, which was very different from what Taft and Roosevelt had done. 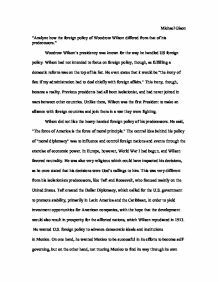 Wilsonset the tone and formula for twentieth century foreign policy.